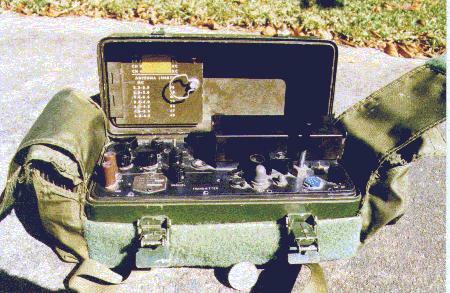 The PRC-64A is a small "special forces" radio set. It was made by the American company "DELCO". Delco made several models of radio that all look very similar ,there is a photo of one on Page 117 of "The Ultimate Spy Book" by Keith Melton. The photo shows a Delco 5300 which looks almost identical to my PRC-64A. The 5300 was reportedly used by CIA agents in the 1960's and 1970's. The 5300 has a frequency range of 3.0-8.0 Mhz. The PRC-64A has a frequency range of 2.2-6.0 Mhz. The PRC-64A radios I have seen were made in the middle or late 1960's. They are transistorised units and have four crystal controlled channels. Four crystals are used for transmit and another four for receive. The crystals are type CR-78U (in RX) and type CR-89U (in TX). The RX crystals are desired RX frequency plus 455Khz. An internal or external key can be used, a GRA-71 can also be used. LOADING Adjusts the inductance of the antenna loading coil to match the radio set to the antenna being used. IND SENS Switch Adjusts the sensitivity of the ANT Indicator lamp. It is most sensitive when on position three. -Three tools are usually provided. These include an allen key (for knobs etc) and two alignment tools. (c)Transmission cable (coax) 35 feet with black molded connector using above two as dipole. -Two earphones are provided (600 ohms). Together they can be used as a simple set of headphones as the PRC-64A has two earphone jacks. -Two straps are provided with the green carry bag. One for shoulder carrying the other for hand carrying. I believe that the PRC-64 was retrofitted to become the PRC-64A by the installation of an "oscillator control assembly" A4A9A3. 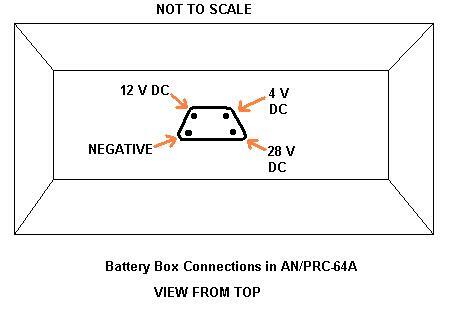 This diagram may perhaps help you to connect power to your PRC-64A.